AS NOTED elsewhere, including the mega-star's own Twitter feed, Tom Hanks is shooting night scenes this week in front of Club Tee Gee on Glendale Blvd. He's directing and starring in Larry Crowne, a 2011 release with Julia Roberts and Brian Cranston, among others. One neighbor noted the production has given the vintage Atwater Villlage bar some "weird awesome windows." Hanks is also causing traffic this week along Los Feliz Blvd., at locations including the "Hollywood landmark" Tam O'Shanter Inn. Traffic Trails on the I-5, originally uploaded by Non Paratus. 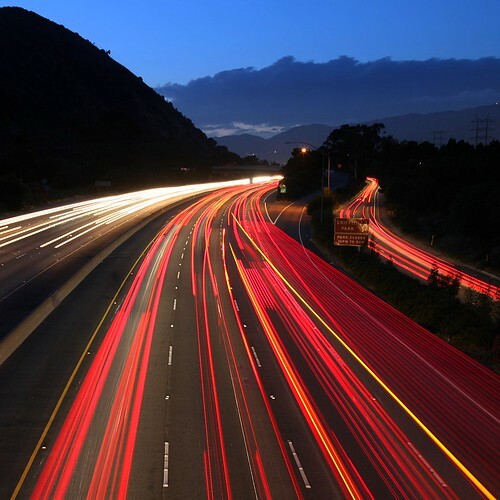 THE PHOTOGRAPHER writes: "Traffic on the Golden State Freeway snakes around the hills of Griffith Park (on the left). The freeway marks the border between the neighborhoods of Atwater Village and Los Feliz. Taking this at twilight, I was able to capture the traffic trails and the deep blue of the sky." Atwater Village resident raising $$$ for his sci-fi short film, "Vessel"
The magazine was kind enough to give me credit and link to my Flickr page. So far more than 2,400 Forbes readers have clicked through to see my original photo, shot on a helicopter tour of Los Angeles. 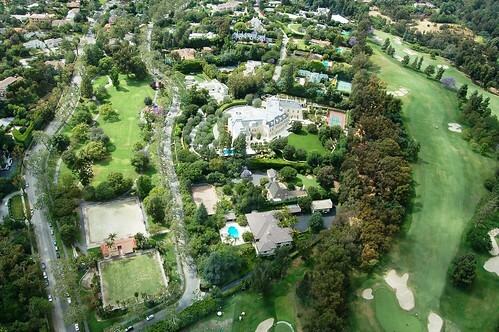 A good portion of them have also clicked through to my May 2009 post about Candy Spelling's listing of the mansion for sale. So, welcome Forbes readers. 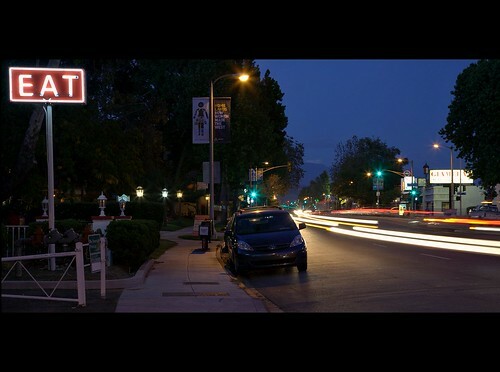 This blog is primarily about Atwater Village, an 8,000-resident neighborhood in northeast LA. We have a Costco. And a wine bar. You might also be interested in 280 more photos from the helicopter tour. Stay a while, look around. Enjoy! COULD THESE be the same parties responsible for those screechy fireworks displays in the LA River in Atwater Village on May 6, May 1, April 22, April 23 and 24? KTLA reports that authorities expect to make arrests in connection with an illegal fireworks operation in the house. Let's hope this puts an end to the riverbed tests. New Parenting Center on Glendale Blvd. 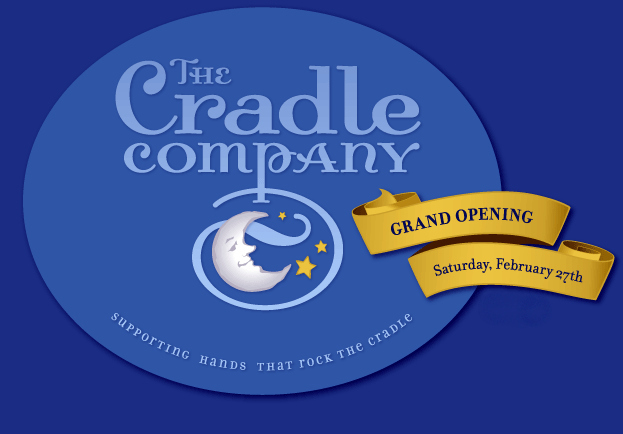 AN ATWATER VILLAGE resident is out to heed the needs of breeders with The Cradle Company at 3042 Glendale Blvd. Brandi Rouse, MSW, runs the baby boutique and parenting center, offering pediatric sleep consultations, doula and nanny placements, mommy and me groups, childbirth education, and more. Photo of the Week: Eat! Eat, originally uploaded by Non Paratus. GREAT NOTE from the photographer: "The sign for the Los Feliz cafe in Atwater Village couldn't be any more direct. It seems to be a throwback to cafe signs of half a century ago." City Shuttering 4 Marijuana Dispensaries on Atwater Village's Glendale Blvd. Accurate Services Medical Dispensary, 3429 Glendale Blvd. Friendly Collective, 3405 Glendale Blvd. LA Collective, 3401 Glendale Bl. Atwater Alternative Care Collective, 3106 Glendale Blvd. LA Times reports they must close by June 7. Also on the list: Tender Love Collective, just over the freeway at 2439 Riverside Drive. Not on the list: America's first "cannabis college," Oaksterdam University, 3153 Glendale Blvd., former home of the casket store. 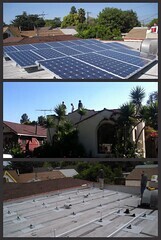 "Last week I had 20 solar panels put on my roof that cover 100% of my electrical usage! DWP [Los Angeles Department of Water and Power] covered half the cost! I would love it if you could blog about it as I think there are loads of houses in this neighborhood that would be perfect for solar. You cannot even see them! "Basically I generate enough electricity that I cover my electricity needs - so I will no longer have an electricity bill! I will only be paying for natural gas which is next to nothing. I have no batteries. The current goes into the neighborhood grid. The meter spins one direction when current flows in from the grid and the opposite direction when I am putting power back on to the grid. I only pay if I generate less than I use. My system is designed to generate 110% of my average usage based on my bills for the last two years. "The company who did my install [Mimeos Sustainability Consultants] was great. They did all the paperwork for the rebates, handled the contractor and made the whole thing completely painless and transparent." TONIGHT THE Los Angeles Police Department is responding to shots fired from Glendale-Hyperion Bridge in Atwater Village. Up to 4 cycles of what sounded like machine-gun fire, 8:45pm Sunday. UPDATE 8:50pm: LAPD helicopters, cruisers, searching LA River bed. Police vehicles racing toward River along Sunnynook Drive. UPDATE 9:10pm: Still activity around Glendale-Hyperion bridge. Police lights on Riverside Drive. Neighbors tracking events on AVNC forum: "at least 15 police vehicles and lots of suspects in handcuffs." UPDATE 9:15pm: Lights, sirens, choppers gone. Nobody else reporting. Time to finish Sunday night TV shows. Y'all are on your own. UPDATE 9:50pm: Great, 4 more shots and/or pops and/or explosions. Maybe guns, maybe fireworks. Does it matter? Are we really going to let them have Atwater Village? UPDATE 10:25pm: Helicopter returns, spotlight on River. 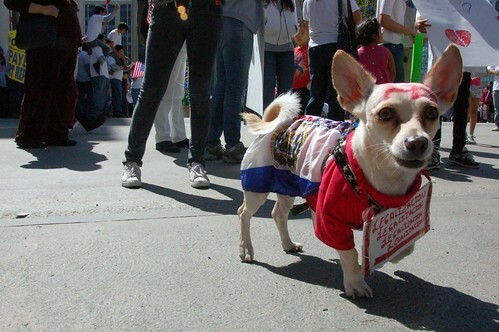 BACK FROM a day downtown, where Los Angeles rallied for May Day in favor of legal immigration and against Arizona's new "show your papers" policy. See the first 12 photos from the rally, with many more to come.